Jared Leto's Joker Officially Revealed! Jared Leto’s Joker Officially Revealed! It’s time for the opinion arguments to begin! Today is The Joker’s 75th birthday; how did DC celebrate? By giving us an official photo of the next incarnation of The Joker to grace the big screen. The first thing that this writer noticed were the tattoos. Tattoos are not synonymous with The Joker; however, these tattoos are mostly visual references to the iconic character. You can see the “Ha Ha’s” on the left side of the chest and the left forearm, The Joker’s signature wide smile on the right forearm, the old calling cards on the upper left chest, and what looks like a little chattering teeth toy that The Joker is famous for using as a weapon on the left hand. The other tattoos we can see don’t really reference anything in The Joker’s mythos, but the skull jester and the facial tattoos seem appropriate for a “real-life” interpretation. We can see other tattoos but can’t make them out yet, including something on the right bicept, something on the stomach, and something on the right side, which seems to be in a familiar font but we need to see more to make out what that one is. Next thing to pop out at you, the facial expression. The eyes, the makeup, and Leto’s scream/laugh are spot on. If this is a representation of the acting to be done for the character, things look bright/psychopathic. Next you can see the signature green hair, the chalk-white skin, the rubber purple glove, and the teeth. The chalk-white skin and green hair are a must, nice to see that continue. The purple glove is another reference to the comic book icon but the meaning behind it being rubber is unknown. Now on to the teeth, this Joker has grills. He has silver grills on his front top and bottom teeth. This is the one thing, above all, that needs the most explaining for. As far as a reference to the comic book go, no Joker has ever had grills. That’s not to say that this can’t work, but we just need more of an explanation on the choice. Could they be a new obscure weapon? Maybe he is hiding a horrendous Brian Azzarello, Lee Bermejo “Joker” smile? If they are using “The Killing Joke” and “Joker” as a reference, we are potentially in for a treat. Finally, is that a new version of The Joker’s signature joy-buzzer I’m seeing on the left pinky? This writer’s opinion: I don’t get the tattoos and the teeth. 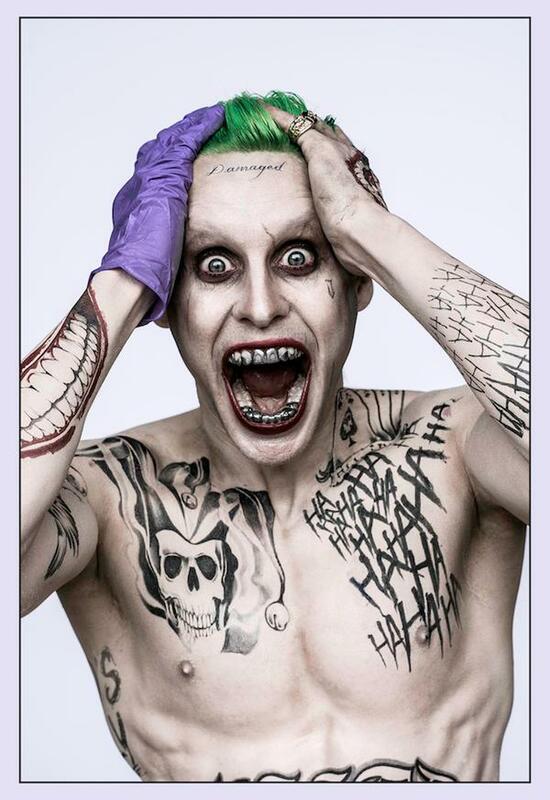 I like that the tattoos are referencing iconic imagery, but I’m not used to seeing a Joker with tattoos. With that said, I like it. Why? Because if I saw this man in my home I would be scared “crap-less.” This man looks crazy, good job Leto and Ayer.